Finding a city’s secret spots can only really happen at human speed. In this series, World Running Guide, we’ll provide information to help you discover your next destination through the eyes (or rather, feet) of a runner. Our 26th president once said, “I grow very fond of this place, and it certainly has a desolate, grim beauty of its own, that has a curious fascination for me.” Teddy Roosevelt was speaking of the Badlands, a prairie paradise where rock formations and hillsides roll on and on for as far as the eye can see. A land where bison roam the roads and prairie dogs and antelope might catch you by surprise. With every step, a runner loses sense of time or routine and just blows along like the billowing grass before them. Welcome to Theodore Roosevelt National Park. When you think of a national park, your first instinct is probably not to run through it. Hike, bike, explore, camp, stargaze, climb—these are all typical activities one might partake within the borders of a preserved landmark. Running, however, is a great way to explore this underrated landscape. The word “prairie” probably sounds like a boring, flat patch of dirt rather than what Teddy’s Badlands actually are: colorful rock and grass lands that have just a hint of bad in them (the name fits) with its towering trails and wildlife. To fly through the land the Mandan Hidatsa Indians called home and inspired Roosevelt’s love for this country’s environment must be nothing short of exhilarating. All that to say, you should probably visit TRNP during the summer or early fall. Winter can get a bit nippy as temperatures drop into the single digits, if not way below zero. Summers are usually in the 70s and 80s, but be careful. The park has also has had record-breaking highs of well over 100 degrees. While this park is often overlooked by travelers, some expert runners have grown quite fond of this landscape, including Runner’s World and Outside Magazine athletes. Whether you’re tiptoeing around a bison herd or training along the Maah Daah Hey Trail, there’s no shortage of wonder to behold. There are three main areas to the Theodore Roosevelt National Park: the South Unit, the North Unit, and the Elkhorn Ranch Unit. The vast perimeter of the park can be overwhelming, so here are three trails to ease you in. The Summit Trail is a short 3.8 miles that has expansive views of the Badlands. Since it goes through some of the roughest rocks in the Little Missouri National Grasslands, the route is quite steep. Whether you merely want a short hike or a rigorous hill workout, the Summit will do the trick. 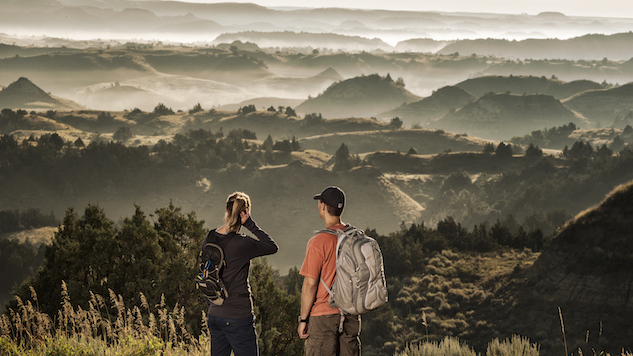 The 4.2-mile Caprock Coulee loop will give you the perfect slice of Badland culture, thanks to a view of the Little Missouri River and frequent bison sightings. If you’re lucky (or not so lucky), you might even spot a mountain lion on your run. Of course, we’ve got to save the beast, ehem, best for last. The Maah Daah Hey Trail is well-deserving of its own column due to its rich, diverse 144-mile stretch. Calm down—nobody’s expecting you to run the entire distance in one day, or even one week (unless you just really enjoy murdering your body). You can pick sections of the trail to run and make a camping trip out of it by resting at one of the grounds, like Bennett or Sully Creek. Epic views of the valley are on Maah Daah Hey at MP97, Devil’s Pass at MP102, and China Wall at MP130. The name of the infamous trail means “grandfather” in Mandan and implies a sense of longevity- this trail is meant to last for a very long time. Even if you know nothing else about the Badlands or the Maah Daah Hey, perhaps you’ve seen a turtle drawing on mile markers. The turtle symbolizes steadfastness, determination and endurance—a fitting combination for a long run through the Badlands, don’t you think? organizes group runs in the spring when weather is warmer and drier, along with helping preserve the trail year-round. While running is obviously the focus here, the Park offers many other activities for you or your family such as fishing, horseback riding, or cross-country skiing in the winter. During his time in what is now his memorial Park, Roosevelt said, “It was here that the romance of my life began.” So pack your bags, take a jog and fall in love with one of the most underrated but inspiring landscapes in the West. Can’t Miss: The Medora Musical for your kids (or for yourself, let’s be honest). McGee Nall is a freelance writer based out of Athens, Georgia. She was probably eating Nilla wafers and Nutella while writing this.